Warning: this post contains a cuteness overload! 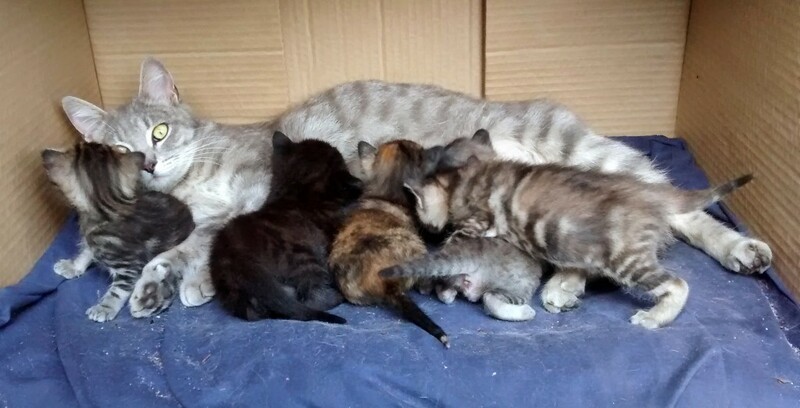 Two weeks before we moved out of our apartment, we discovered a stray cat gave birth to 5 kittens on our neighbour’s patio! We only noticed them by chance, as we were walking Jasper, and neither of us had any idea what to do. But we knew we needed to help in some way. 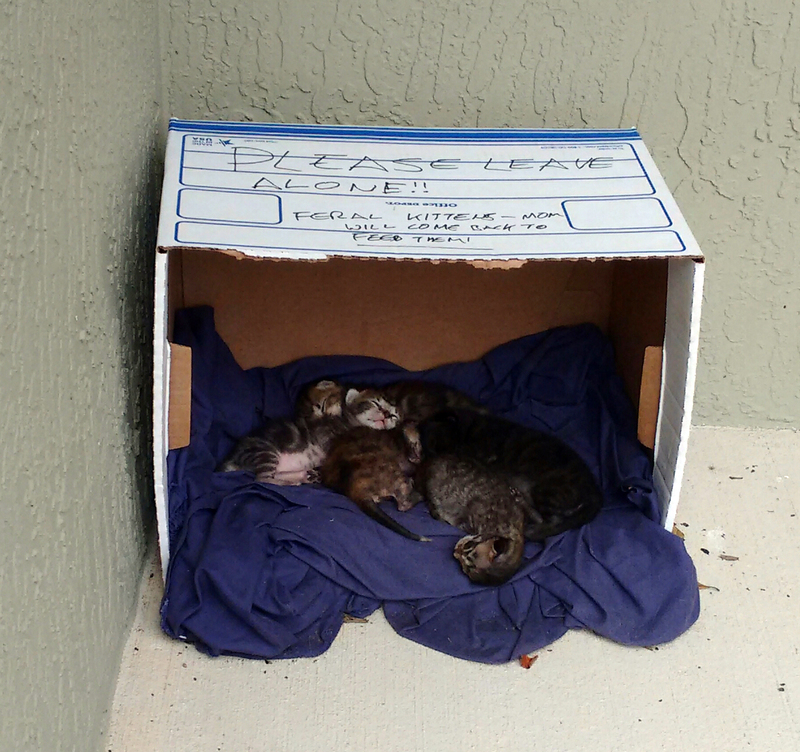 The apartments wouldn’t let us bring them inside, so we talked to our neighbour and she was happy for them to stay on her patio – which was sheltered with bushes – and we took a box out to them with a nice blanket inside to keep the kittens warm. They were about 1 week old, and adorable! 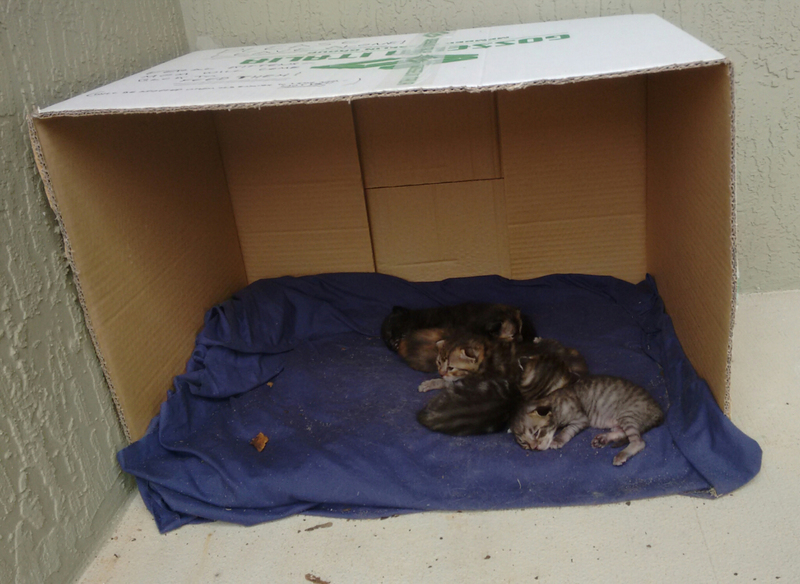 The Mom-cat ran off when we went near them, and we just had to hope she would come back after we’d put the kittens in the box (on it’s side, so they could wiggle in and out easily). For a while I stood the other side of the hedge after I put the food down for Penny, and just talked to her while she ate. Saying her name, and “good girl”, and any random things that came to mind. Then after a week of that, I started standing the same side of the hedge as she ate, then worked on moving the food closer to me and sitting down with her. I don’t look silly at all! 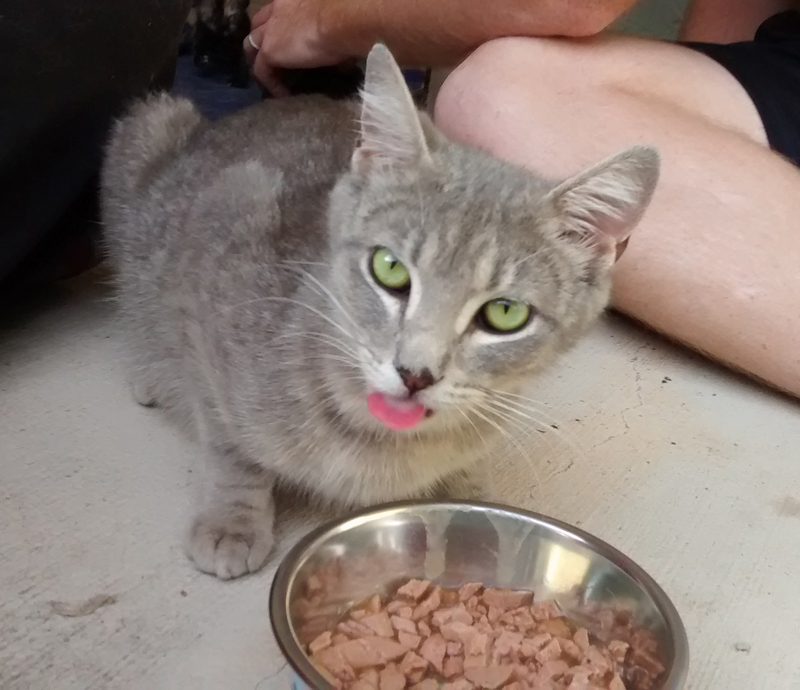 Eventually she let us pet her while she ate, and she let us pick up the kittens without running away or hissing at us. Awesome progress! We also walked Jasper past the patio twice a day and stopped with him far enough away to not be a threat, but close enough so Penny could see him when she ate her dinner and get used to him being around. All of the local no-kill shelters were full, so we were stuck with what to do long term. I did a lot of googling and found two great local places – one which did a spay-and-release program (which we kept as a back-up plan), and the other is a local foster group. 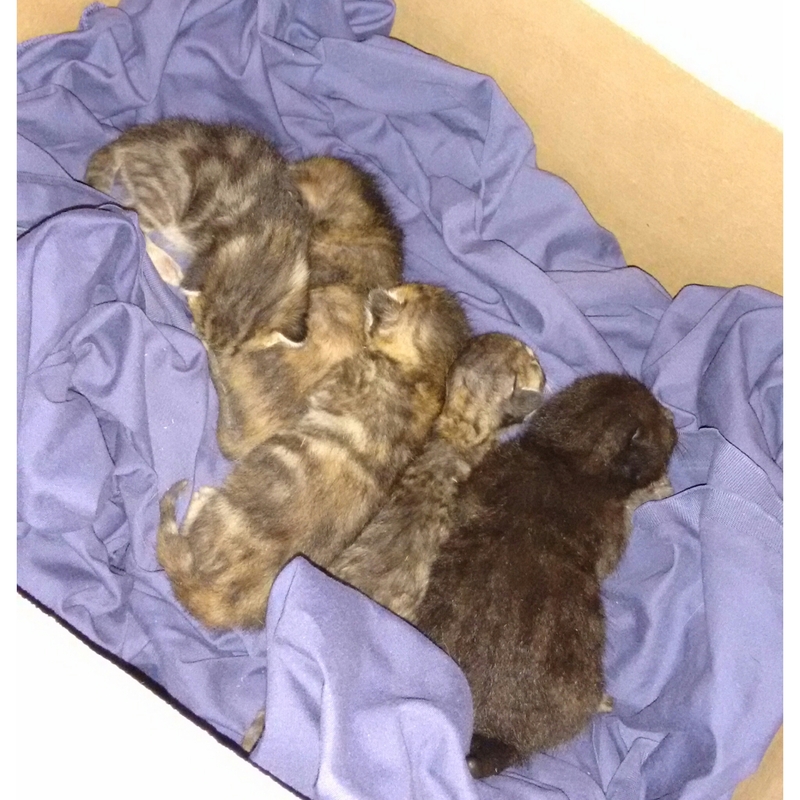 The foster group was full, but the lady who runs it said she would be able to pay for the Mom and kittens to be checked by a vet, get their vaccinations, etc if I could foster them until they were old enough to be adopted. Which was such a great outcome for 5 kittens and a super-skinny stray who probably wouldn’t have made it otherwise! 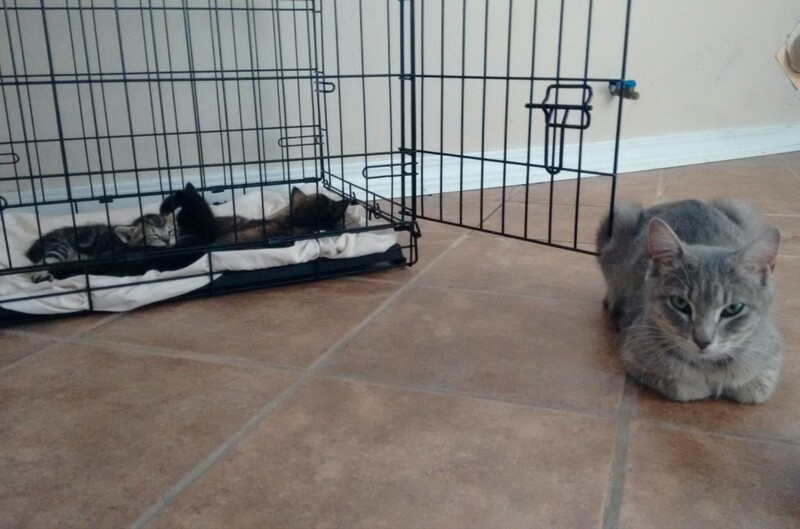 We made a plan that if we could catch her when we moved, we would take them all to the vet a few days later. 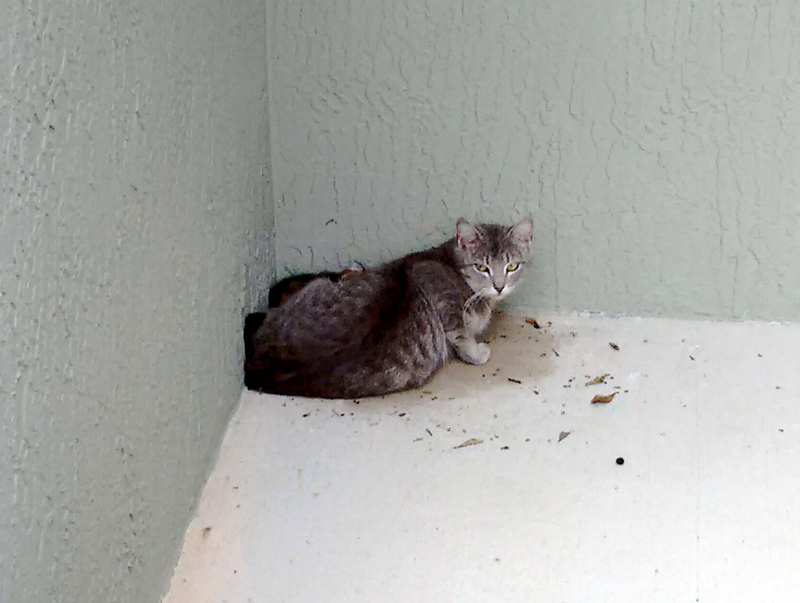 The day we closed on our new house there was a huge thunderstorm, and the kittens and Penny got soaked with rain! So they gained a box-upgrade for the next few days, until we moved everything into the house and could then try and move them all with us. If she would let us catch her. We bought a small wire dog crate, and placed it next to the box for a while before we even tried to put the kittens or Penny in there. She was a little wary but was happy to sniff it, and by this point she would let us stroke her even without food. We carefully put the kittens in the crate, and Penny was watching, then we stroked her and gently put her in the crate too. As soon as the door was shut she went wide-eyed and meowed! But she had the kittens with her so she was fairly calm as we drove to the new house – which was thankfully not very far away! 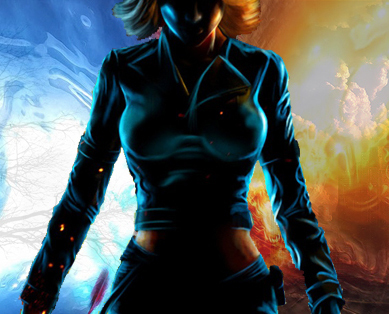 The adventure continues – new posts coming soon!